Visiting one of my sixteen great-great-great-grandfathers’ hometown, and staying with some of his great-great-grandkids. Drifting down the Rhine past castle after castle. If you could ever get sick of castles, it’d be here. Flying down the autobahn (freeway) at a whopping 140 MPH and still being passed. Popping the tire on the rental. Rocking Munich with Barb’s friend Lisa and husband Yasser. Thanks so much for being such gracious hosts! If you’d want to hear more, you’d have to ask, because there’s just too much to put down right now. 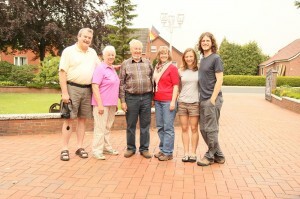 It was wonderful to be with family again, but it was also hard to say goodbyes. I though we had taken care of those back in June. As such, I finally felt like we had begun our journey as Dad and Barb drove off to the airport with us and our backpacks left in a dusty parking lot. Off we go; when will we meet again? Written by: matt on July 18, 2011. July 18th, you know what that means… It’s Kate’s birthday! Happy Birthday, Kate! Wahoo! Thanks for everything Lesa and Yasser!